Voted Yorkshire Brides Florist of the Year 2007/8, for the second consecutive year, Hart Company has been described as the north’s most exciting new florist. 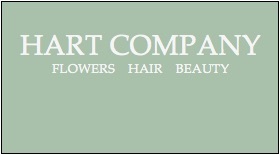 The company offers clients flowers for weddings, parties and events, all over the north of England. The style of floristry is quintessentially English, very natural, with a quirky twist. Clients can hire or buy a range of vases, candelabras, storm lanterns and topiary trees to create a sumptuous look for their day. We have the most stunning range of bridal gowns and accessories in styles and budgets to suit all. All about Gary Walsh Photography..... By Gary Walsh. It‚s been 10 short years in business so far and I am loving it! - I have met and photographed loads of lovely people, us ordinary folk and a fair few celebrities‚. Along the way I’ve won stacks of national awards and lectured all over the world (get me!) I am now a very important trainer in one of the biggest photographic training organisations in the country, but for me the best bit is still taking the pics! I specialise in creating beautiful make-up for weddings and special occasions, using products that will last all day and are particularly suitable for photographs. Exclusive range of bridal gowns, bridesmaids, evening and prom wear, shoes and accessories from many of the leading designers. Frederic and Jane are cake designers, confectioners and chocolatiers for all occasions including weddings, anniversaries, birthdays and special events.